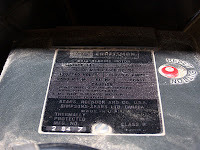 Friday a Freecycle ad was posted for a "Not Working Radial Arm Saw". I never get in on these, but fired off an email anyway. Turns out I was the first responder. YAY. I get there Friday afternoon, and the tool was already disassembled for travel. So I didn't get a chance to check it out before taking it. I loaded it up in the Guacamole Bus and took it home. It wasn't until Sunday afternoon that I got a chance to unload it and put it together. Everything went together nicely like it should, and I plugged it in. One last look over before hitting the power button, and I found the breaker tripped in the motor. I pushed the big red "RESET" button and it clicked. Hit the power switch and it whirred into life. All that was wrong with it was the breaker had tripped! 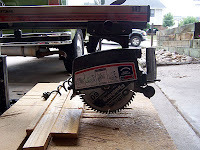 This saw has a reasonably powerful motor. The head moves smoothly on the arm. All the adjustments are positive and solid. All-in-all a decent saw. I haven't trued it up yet since I really don't have a place to put the thing. 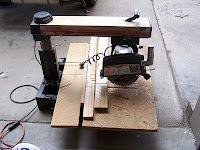 A radial arm saw is a large tool and needs elbow room. Room I just don't have. 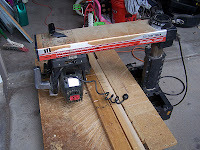 I think I'll put it on the bench where my 10" Craftsman Bandsaw lives, but I'll need to build a base for the bandsaw. 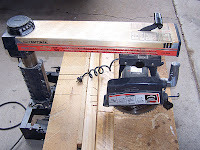 A base for the bandsaw wouldn't need to be as substantial as the one for the RAS would, so I think that'll be the better decision. What would be great is if a larger garage fell out of the sky and attached itself (neatly) to my house. In the meantime, I'll enjoy my free saw. 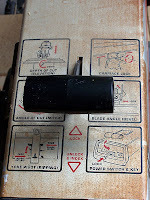 By the way, that Oldham 60t carbide blade came with the saw.